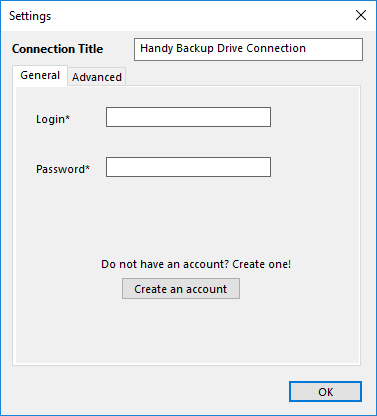 To backup, restore, or synchronize data located at HBDrive, you need to create a configuration for the Online Backup plug-in. If you want to learn about HBDrive and creating an account, please refer to Handy Backup Drive (Online Storage Service). The configuration dialog consists of the two tabs: General and Advanced. In a top field, enter a unique name for your particular online backup configuration. On the General tab you can set up basic connection parameters to HBDrive. 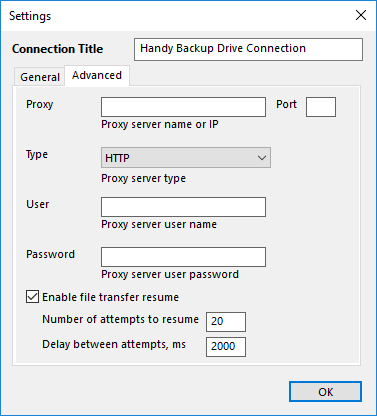 With the Advanced tab you can set up advanced parameters of HBDrive connection, such as proxy data. Please note that plug-in proxy settings override the common proxy parameters of a program (please refer to the Proxy Settings article of this manual). If your proxy server doesn’t require authorization, leave User and Password fields empty. The two other fields handle the plug-in reaction over the unexpected problems encountered. Enable file transfer resume – if there is a connection problem, the program will automatically reconnect to the HBDrive servers and resume the work. To learn more about HBDrive, please refer to HBDrive (Online Storage Service).